A grid is an organizational tool, often invisible, that composes a city, a sports field, a building plan and façade, a space and furniture layout, a view, a poster, a painting, a computer screen, a slide file, a view of space and many more things! Grids organize things at all scales. In its simplest form, a grid is a regulating field of lines that cross at right angles, or 90 degrees. Common grids are composed of horizontal and vertical lines crossing each other. 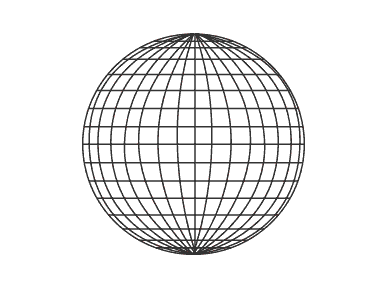 Grids can also be composed of curved lines (as in a mesh in space) and lines at angles. 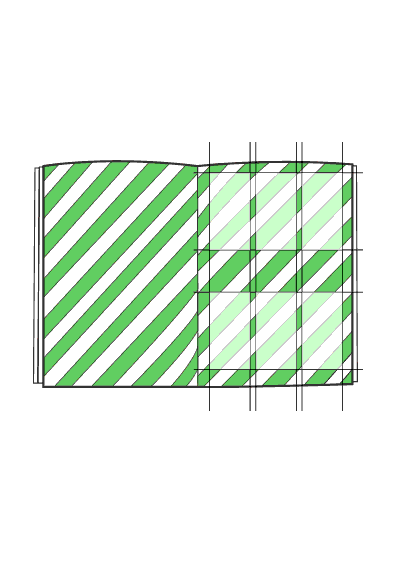 Sketch a few grids in your sketch book then start looking at where grids help bring order to our world! Did you know that many cities are based on a grid? Ancient Roman cities like Paris have a central street running north and south (rue du Jacob) and a road running across the city east and west (Rue du Rivoli). Grids have been used as an organizing tool for engineers to compose streets, roads, blocks and neighborhoods for thousands of years. Cities all over the road can be seen on Google Earth[and **Google Maps] to be organized with rectangular blocks. Sometimes looking at a town or a city, though, you cannot find a grid. When might a grid of roads be not the organizing scheme or when might a grid be interrupted? Natural landforms such a river, lake or mountain interrupt city grids and create unique arrangement of roads. Ancient footpaths sometimes run diagonally or take the shortest route between point A and point B. Sometimes ancient cities in need of protection are organized as walled central cities. Take a closer look at maps and find cities based on grids. Find cities based on grids with disruptions. Find cities based on a central point. Draw two of each example in your journal. Walk around your house or your school. Take a closer look at the windows in these buildings. Some of the windows will have gridded frames of wood and or metal. These grids offer support for the structure of the window; they may also offer different functions for parts of a window like opening and closing for fresh air; they may compose decorative glass above or at the sides with a clear view in the middle. Window frames become part of the composition of the façade or face or elevation of a building. Look closely at different window grids. Some are vertical and some are horizontal. Record a few of them. 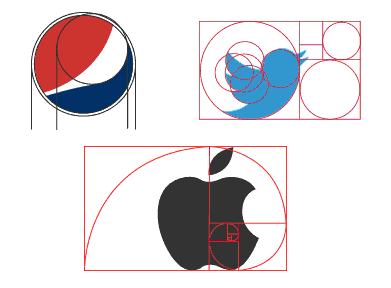 They express different compositions. Record at least five different window frames in your journal. Always look at windows and window grids and imagine how they frame the view! Measure and draw two sports fields in or around your school. Check your gym. Check your recess area. Research sport field grids and make dimensioned sketches of the different sizes of athletic fields. Look at grids in basketball, football, soccer, rugby, volleyball and hockey fields. Even a baseball field fits into a grid of sorts. Make your small sketches in your journal then create a poster of sport field types drawing all of the fields to the same scale. You might draw them separately then study how to best arrange them on your poster. Be an athletic field designer! In graphic design, a grid is a two-dimensional framework that consists of a series of intersecting (straight, vertical, horizontal, curvilinear and/or angular) guidelines used to structure content. The grid serves as an armature over which graphic elements such as images, symbols, titles and text are organized. Grids help designers lay out graphic elements on a page, in relation to other graphic elements on the page, and in relation to other parts of the overall graphic project. There are many variations of grids! Explore and draw at least five different layout grids in your journal. 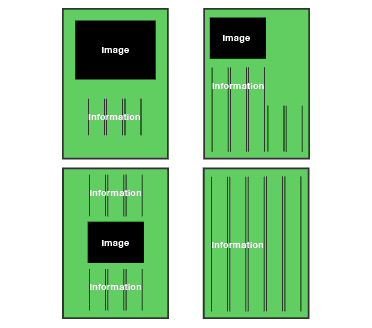 A page layout grid for books (shown in white or sometimes light blue or gray) is a series of intersecting vertical and horizontal grid lines. The grid allows for binding on the right side of one page and the left side of the facing page. The text or content is not part of the grid but is inserted into the grid. The text is applied to a particular page using the grid “flush left” along the bottom sides and right-hand sides of grid lines. The same grid may be applied to multiple pages using different types of content or different styles of the same content type. Draw a basic page layout inserting both text and image. 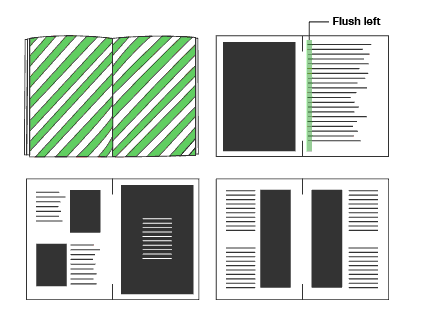 Pages in newspapers, magazines and books are organized by gridded layouts. The most common page design is the single column grid. By narrowing the columns, you can create multi column layouts. When organizing large photographs on top or bottom of pages, the horizontal grid or lateral divisions across a page help to organize text, titles and images. Finally, a combination of all of the above, a modular grid creates visible or invisible vertical and horizontal divisions to organize information.Take a look at these grids and become an organizations whiz! Use grids when visualizing images and information! Draw example(s) of each in your journal and post to the gallery! [Posters}(http://www.next.cc/journey/design/poster-design), or large public banners, are often laid out on grids. The grids helps designers align text, place images and compose a hierarchy of communication. Grids, underlying the structure of composition in a painting, can help direct the movement of the eye as to what is looks at first, second, third, etc. Pick one of the activities in this journey and make three different compositions using three different grids. Compare them side-by-side. See how they communicate ideas. Grids are flexible.Have an agile mind. Rearrange content and compare how it communicates. Make two posters with the same content in two different ways using an underlying grid. 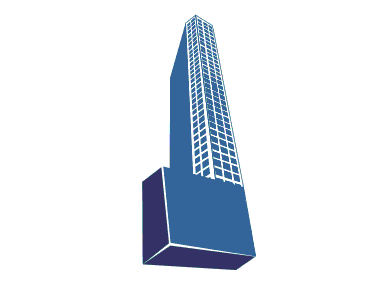 In a tall building, the entire curtain wall, or façade surface, may be composed and organized in a grid. Some window and wall grids are predominantly vertical. Others are predominantly horizontal. Some have solar shade elements. When should grids work one-way or another? Take a look at the grid patterns of windows and curtain walls in your town. Make a picture poster of drawings of gridded curtain wall grids. Which ones do you like? Which ones do you not like and why? A grid is always invisible. Grids can consist of angular lines. City grids are never interrupted. Grids are used to configure official sports fields. In architecture, grids are always stuctural.